Geopolymers are the new inorganic materials with a polymer structure of molecules. They possess high strength and a range of specific properties. used for their production are mainly minerals of geological origin. The first to use the term geopolymer was a French chemist Joseph Davidovits in 1978. The term geobeton was suggested by Russian engineers of Renca Rus as a particular case for construction materials based on geopolymer binders. The use of geobeton in construction is widely spread in Australia, Ireland, USA and others. For instance, in 2014 for the first time an entire airport in Brisbane was constructed with a concrete based on geopolymer binders. Moreover, metropolitan tubings and elements of the load bearing structures are produced. Back in the 80-s of the 20th century in USA they used special high strength geopolymer concretes for the airfield and road repair. In Russia the development of similar materials started in 1950s. The research works were made by the Kiev Institution of Civil Engineering guided by Glukhovskiy V.D. Various objects were built including civil and industrial constructions (residential house in Lipetsk, a part of the railroad with concrete ties in Moscow region, a motorway in Magnitogorsk, surface of the tank training battlefield near Chelyabinsk and others). 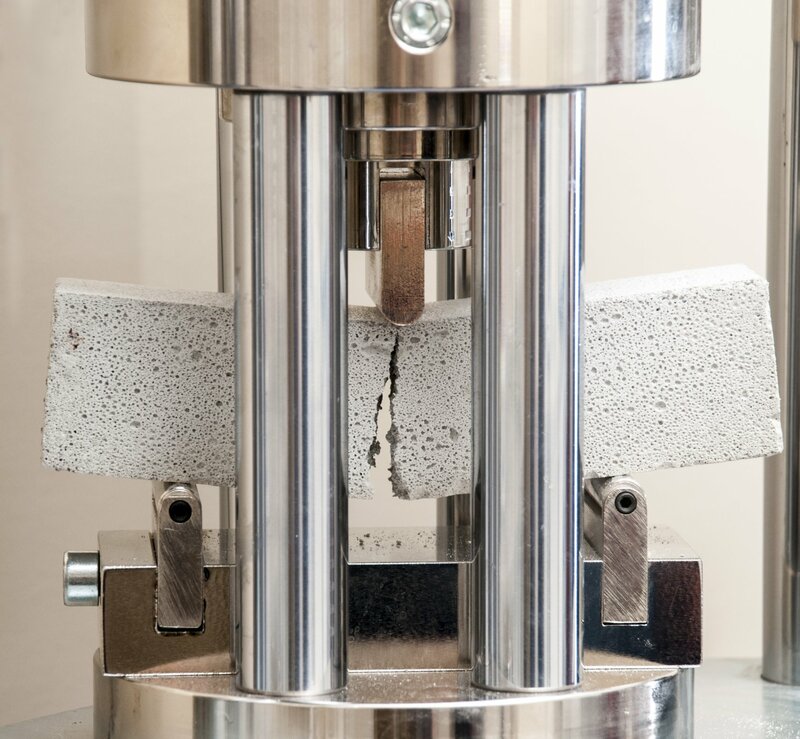 Technology of geopolymer concrete is based on idea of applying inorganic mineral substances the production of which does not require the additional use of natural resources and does not lead to CO2 emissions into the atmosphere (byproducts of metallurgical, electrometallurgical industries and power plants). Geobeton is chemically inert to a range of aggressive substances, it is sturdy both to high temperatures and severe climates. Thanks to excellent physical-chemical properties geobeton can be widely used in construction. In comparison with traditional concrete production technology based on portlandcement, geobeton has better results in strength, durability, freeze-thaw resistance, fire resistance, heat insulation, corrosion and aggressive substance resistance including some types of acids. As a result, the use of geobeton improves general ecological situation by reducing CO2 emissions by up to 90% and recycling industrial byproducts. Their properties enable their implementation in the spheres with specific requirements towards concrete. High resistance to various acids and aggressive substances, and high sulphur resistance due to the absence of сalcium compounds in the structure. Excellent waterproof properties are achieved thanks to mesoporous structure of the material, big molecules like water can't enter in the geopolymer matrix even if they are pushed using external forces. to high level of freeze-thaw resistance. Unlike ordinary portland cement based concretes, water in geopolymer concretes is present on molecular level in not bound state and if heated it easily evaporates and does not explode the concrete from inside. By using high quality aggregates and geobeton one can create thermal insulation materials and plasters. in the first three days, this increases the construction speed. In the process of geopolymer cement production the CO2 emissions are reduced by 90%. Possibility of utilizing wastes and byproducts of existing industries. High level of physical-mechanical properties and durability, higher compressive strength and axial tension strength, freeze-thaw resistance, water impermeability and resistance to abrasion. To achieve special properties no additives or modifiers are needed, due to fast strength development the speed of the project implementation increases. The traditional portland cement industry is the second largest producer of CO2 globally. With the population growth and corresponding increasing demand in concretes and cements, ecological aspects become a major concern of the generation. use of wastes and by-products of the existing industries. Geocement is a material of the future that reduces the global warming impact by reducing CO2 emissions int the atmosphere due to eco-friendly production process and the use of various industrial wastes. This make Geocement a sustainable green product. The environment must be protected by preventing dumping of waste and by-prod- uct materials in uncontrolled manners and by significantly decreasing Carbon dioxide (CO2) emissions. Interest towards green and sustainable building has grown in Russia in recent years. There is a special certi cation system in Europe in the sphere of green and sus- tainable construction (LEED certification or «carbon credits»). Application of Geocement in construction completely corresponds to this certi - cation system and gives an ability to gain additional points. Buildings constructed with Geocement produced by Geobeton company would earn additional LEED points compared to conventional construction materials. A green building is one which uses less water, optimizes energy efficiency, conserves natural resources, generates less waste and provides healthier spaces for occupants, as compared to a conventional building. Considering the tremendous bene ts that it offers, green building concept is gaining major importance in the world. By adopting Green methodologies we would be able to reduce the carbon footprint and would be helping the environment. Construction industry is one of the major consumers of natural resources such as cement, sand, rocks, clays and other fossils. The ever increasing unit cost of usual ingredients of concrete have forced the construction engineers to think of ways and means of reducing the unit cost of its production. At the same time, increased industrial activity in the core sectors like energy, steel and transportation has been responsible for the production of large amounts of by-products such as fly-ash, blast furnace slag, silica fume and quarry dust with consequent disposal problem. Geopolymer technology completely corresponds to the concept of green building by optimizing energy efficiency of the buildings, preserving natural resources and at the same time utilizing the by-products of other industries, thus decreasing the CO2 emissions by up to 90%. Geocement can be applied as a component for various products with a wide range of applications in different industries. Together with the introduction of 3D-printing technology in construction, geopolymer binders and geobetons on their base make a new step in development. And already widely used in this technology of buildings construction. About 100 m2 accommodation in 24 hours. No waste, faster construction period. Due to the use of industrial by-products CO2 emissions are reduced by up to 90% in comparison with the traditional technology. In Irkutsk for the rst time in Russia successful tests of géobeton (geopolymer concrete) were made in printing constructions on the mobile 3D-printer. A Russian-Italian company Renca Rus, LLC has elaborated and tested various compositions of geobeton based on geopolymer binder for the technology of 3D-printing on mobile construction printer of the company Apis Cor. This experience is unique. Both technologies are at the start of conquering the construction mar- ket, but the representatives of both companies believe that the future is in fast and eco-friendly construction. The tests have shown a high e ciency of geobeton. Due to its specific composition an ideal for 3D printing consistency of the mixture was reached. This shortens the time of construction: the houses can be built within hours. The elaborated formula of geobeton is the most suitable for the technology of 3D printing due to a higher thixotropy, fluidity and an ability to adjust the setting time, with a constantly high mechanical strength (compressive strength reaches 100 MPa and more). Moreover geobeton is cost-eficient eco-friendly material thanks to the use of industrial byproducts. Engineers of the company Renca Rus plan to modify compositions of the mixtures to adjust them both for the hot climate and severely cold temperatures, as well as to create the mixtures on the base of various local raw materials in the regions of Russia and worldwide to optimise the cost and properties of geobeton and to enable its efficient implementation with the mobile construction 3D printer of Apis Cor.